Well, some time ago I download a picture form Natsu that I like too much, this pic was a colored from the manga and is this pic. I clean all the pic, even some effects that I want to make by myself and with my style. Like always, I use brushes and filters, and this time I hope the blur doesn’t make a problem like the Font. The textures was more from the background, that I think was the most complicated to think to me, be cause the imagination doesn’t come…. But then, with a little lucky find this way and, I know is simple, but I like who it looks. ASWESOME ! i wanted a angryy natsuu ! THankss lovee it ! Haha this wall is so great ... ! Ah...Natsu is very cool ! nice wall ! It looks rather scary when he has that expression on his face and i don't really like the background but for some reason, it seems to fit him. by far, one of the best natsu wallpapers out there. Love how it shows his raw intensitity! 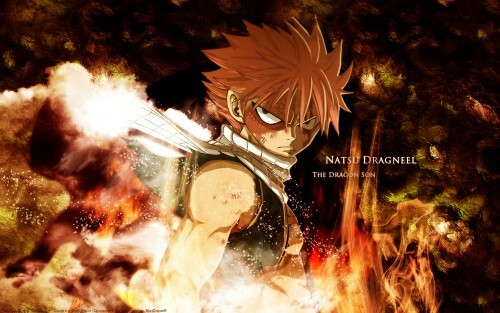 Natsu~~~~ he so cool~ I like the way he fight! Wow, nice effect. I love fire ? Nastu is just too epic for words when hes in Dragon Force Mode! Whoa, i'll have to agree with Lugo25 on this one. This is just simply epic. yaay! so cool thanks for sharing!